“First of all, the fight is being distributed to 350 million possible viewers throughout the world. This fight is available in Canada, in Brazil, Mexico, Bolivia, Chile, Ecuador, Paraguay, Peru, The Dominican Republic, Venezuela, The Phillipines, Australia, Mongolia, India, New Zealand, The UAE- Abu Dhabi and all this countries down there. In the UK, the entire will be on BT Sport, and the main event for the first time ever here will be on Channel 5, open TV to everybody. We’re in Ireland, Sweden, Denmark, Norway, Croatia, and Israel. All of those countries in Israel, 350 million homes. “They create their budgets at the beginning of the year and it wasn’t in their budget to pick up these fights. You know, not to say they don’t pick them up later, or whatever could happen with the deal, but that’s what happened. So, it’s either no onebody gets to see them or you put them on Fight Pass. 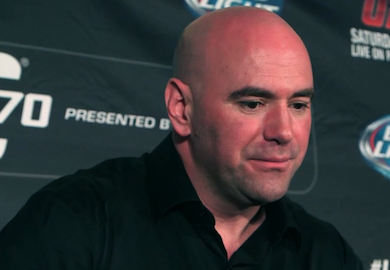 – Dana White via his pre-fight media scrum last Friday in London.